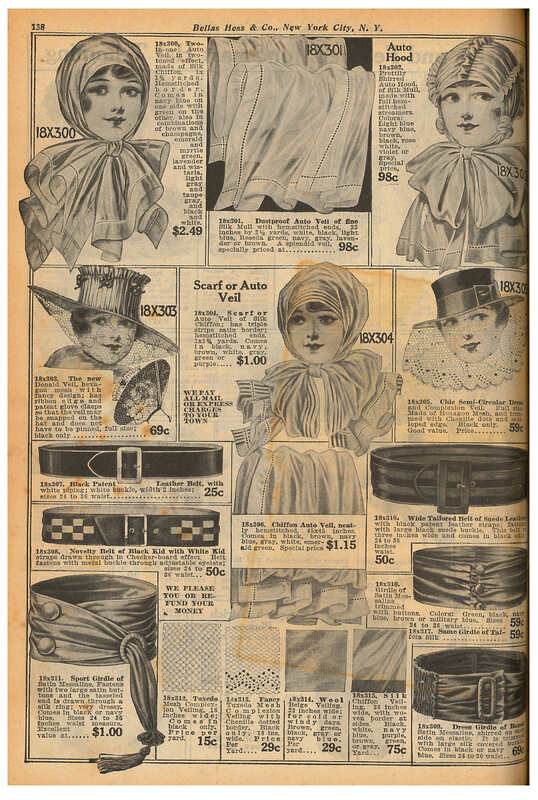 Both the 1916-1917 Bellas Hess & Co. and the 1908-9 Wasserman-Gattmann Co. fashion catalogs contain all the necessities for beautiful bridal wear. Bellas Hess & Co., New York, NY. Fall and Winter Catalogue No. 74, 1916-1917, front cover. Wasserman-Gattmann Co., Sacramento, CA. Nonpareil Fashion Catalogue No. 33, Autumn & Winter 1908-9, front cover. Traditional brides typically wore voluminous veils that completely covered the face prior to kissing their groom. However, in the early 1900s women sometimes opted for veils attached to a hat, such as the examples below. This allowed for the more fashionable modern mesh that was shorter and also detachable, as shown below in the Bellas Hess & Co. Fall and Winter Catalogue No. 74. Bellas Hess & Co., New York, NY. Fall and Winter Catalogue No. 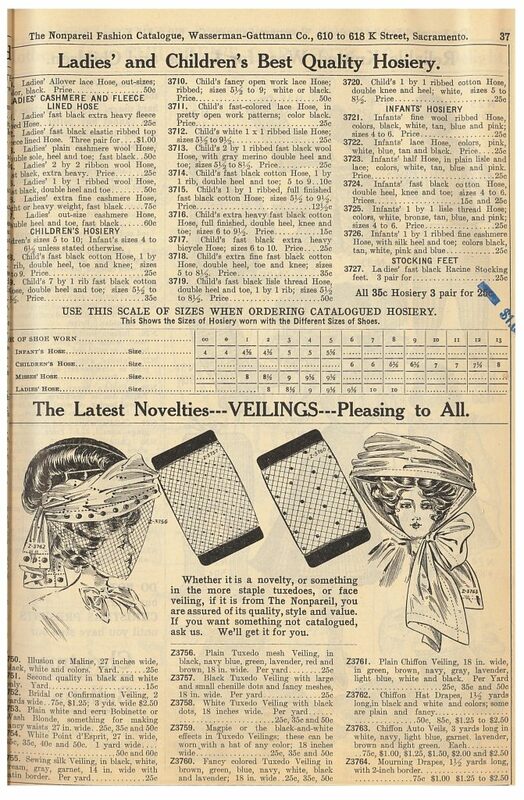 74, 1916-1917, page 138, hats, veils, and other accessories. Formal veiling attached to wide brim hats wasn’t just for weddings but for fancy events as well as everyday use. This fashionable headwear could be customized in different colors, embellishments, netting, or even prints. 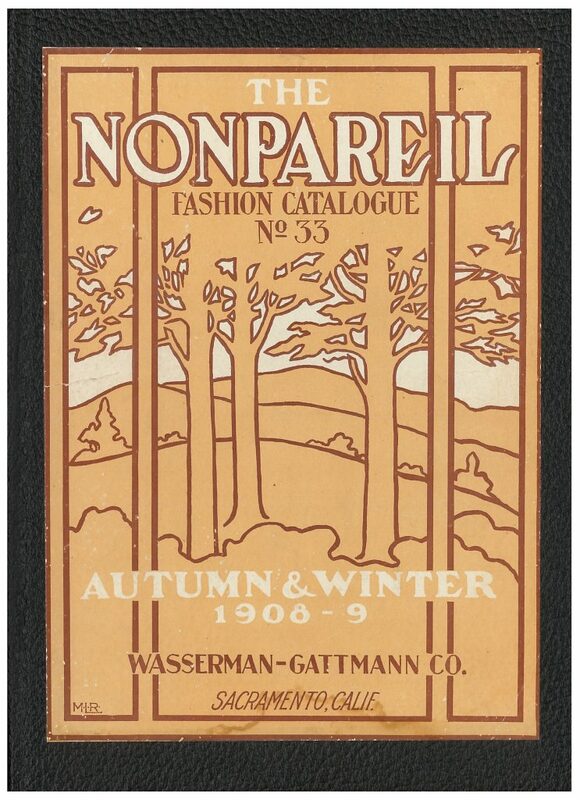 Some examples are described below in the Wasserman-Gattmann Co. Nonpareil Fashion Catalogue No. 33. Wasserman-Gattmann Co., Sacramento, CA. Nonpareil Fashion Catalogue No. 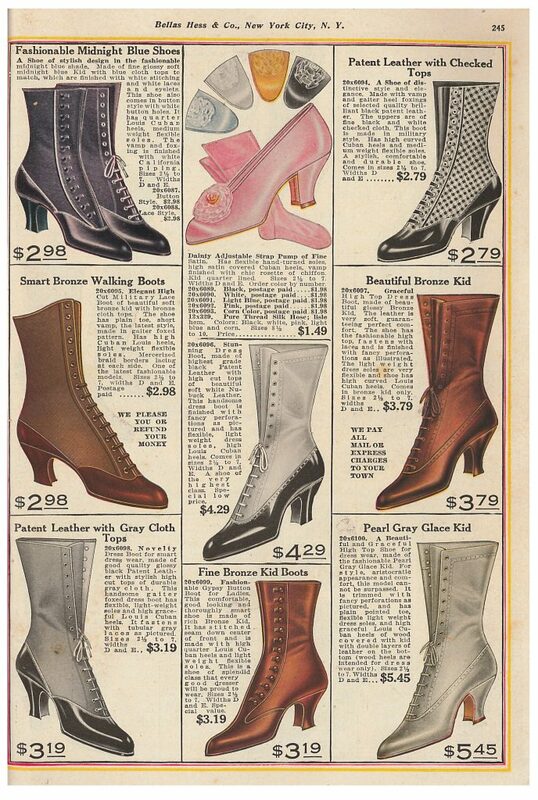 33, Autumn & Winter 1908-9, page 37, hosiery and veilings. Every bride needs some dazzle from head to toe to complete her “perfect day” outfit. Brides of the early 20th Century might have worn rosette decorated Cuban pumps, complete with matching stockings. For some extra sparkle, Bellas Hess & Co. offered solid gold jewelry with precious and semi-precious gems. Bellas Hess & Co., New York, NY. Fall and Winter Catalogue No. 74, 1916-1917, page 245, shoes. Bellas Hess & Co., New York, NY. Fall and Winter Catalogue No. 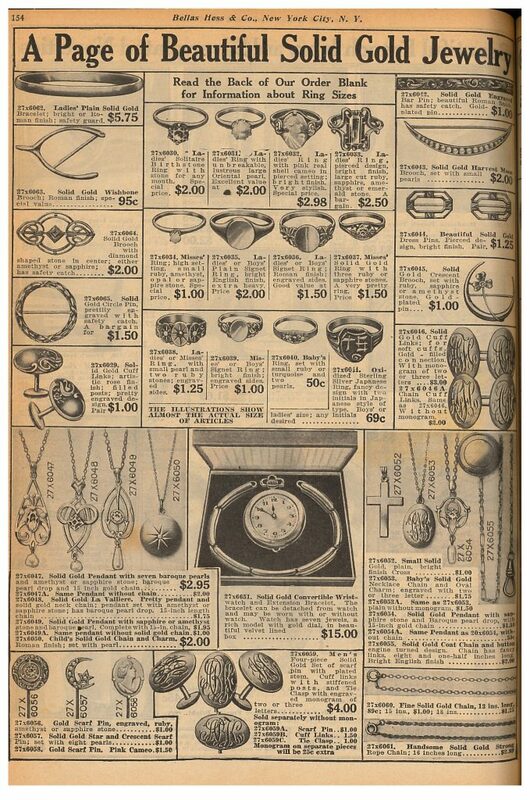 74, 1916-1917, page 154, jewelry. The bride’s ensemble would not be complete without the ivory white satin dress. For $19.98 this bridal dress exemplified exquisite style. The white satin bodice with an epaulet cape trickled down into a tiered skirt of floral lace with pearl bead trimming. A touch of elegance could be added with silk gloves. For an extra cost, a bride could purchase a fine white net capped veil embroidered with white silk and a bridal wreath with wax orange blossoms that could survive the test of time. These fashions of the past can influence early 21st Century Spring brides. And as a gift for her groom, the bride could present him with stylish socks so he won’t get cold feet on the big day! Bellas Hess & Co., New York, NY. Fall and Winter Catalogue No. 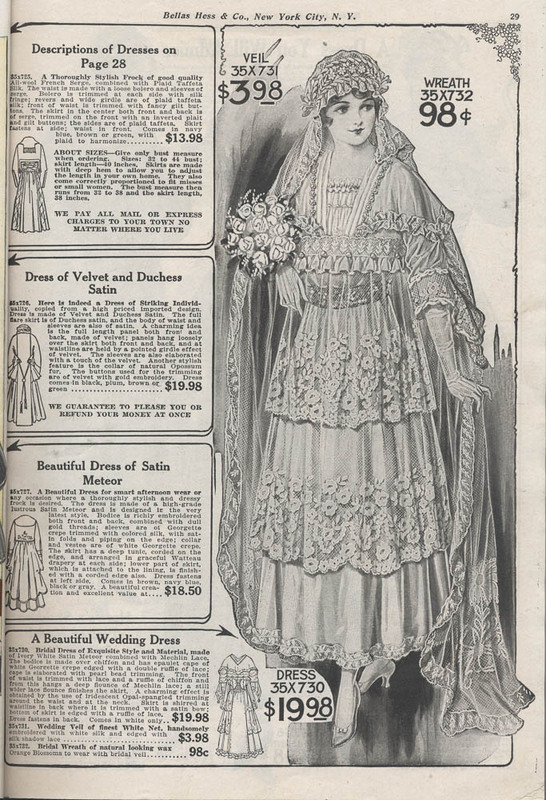 74, 1916-1917, page 29, wedding dress with veil and bridal wreath. 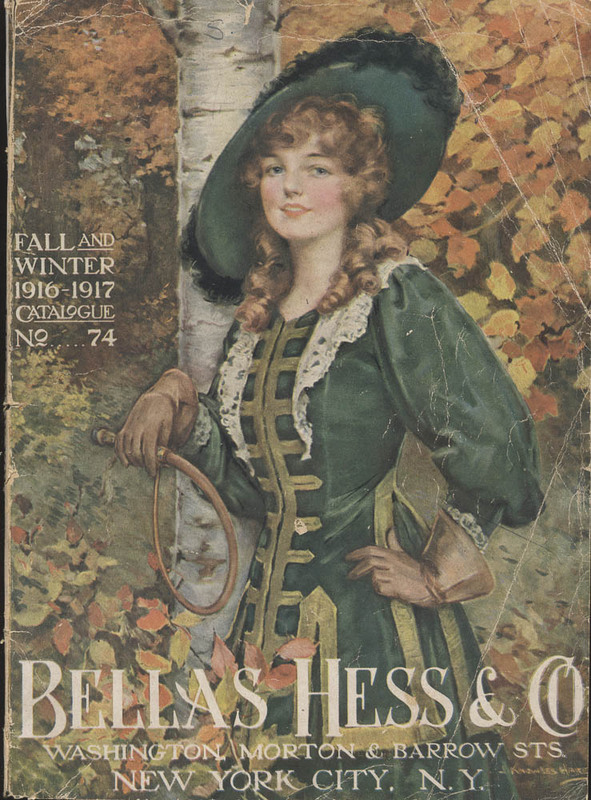 Both of these Bellas Hess & Co. and Wasserman-Gattmann Co. fashion catalogs are located in the Trade Literature Collection at the National Museum of American History Library. Take a look at the Galaxy of Images for more pages from the Bellas Hess & Co. Fall and Winter Catalogue No. 74.